Mariner’s Park is a unique place to live, where retired seafarers and their dependents can live alongside others who have lead similar lives. The 16 acre estate has immaculately kept grounds with views of the River Mersey and the iconic Liverpool waterfront. 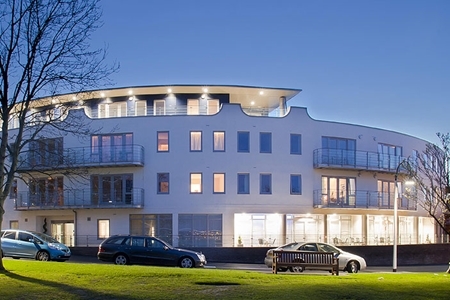 The project was a new build which required phased installation over a period of 5 months during which a new multi-loop fire alarm control panel was installed to support addressable field devices in the communal areas plus the Apartment Control Units (ACU) and their relative devices within the apartments. Due to the nature of the site, our Amalgamated branded enhanced grade fire resistant cable [BS5839-1:2002] was installed throughout to provide the system with additional integrity. According to recent research, around 80% of all UK fire deaths and injuries occur in dwellings. Following the shocking revelations in the recent update of the COP for fire alarm systems in dwellings, where there are around 500 fatalities and 14,000 injuries caused by fires in dwellings per year, it was important to design a system that provided detection throughout all areas. It was essential however that the system remained flexible whilst maintaining its integrity due to the nature of the premises. In a residential care home like Mariner’s Park, the risk is no greater than in an apartment block where fire can spread quickly from one apartment to another. So how did we go about solving the issue? The ACU’s within the apartments are designed to sit on the communal fire alarm panel’s analogue loop and to communicate its status back to the host panel for the attention of building management. Each ACU provide each individual apartment with its own two minute silence facility [to BS 5839-6/12.2b] and 15 minute isolate facility [to BS 5839-6/12.2a]. They include a built-in loop isolator with a conventional detector circuit and a conventional sounder circuit allowing each individual apartment to contain the required detection and warning devices. The whole system is geared towards reducing unwanted false alarms by putting the tenants in control of their own fire detection systems without losing sight of the fact that its primary purpose is to protect life, property and the environment. If, at any time, the main analogue fire alarm panel enters a general fire alarm condition, it overrides any hushed state at the ACU’s and turns on the local sounders. In addition, the ACU’s and all of its cables are monitored. Therefore, should an open or short circuit occur, it would be immediately relayed to the building management who could then investigate. This was an exciting project to be involved in as it involved using technology at the forefront of the fire and security industry. For more information, please contact us and we would be happy to further discuss this, or any other solution in greater detail.